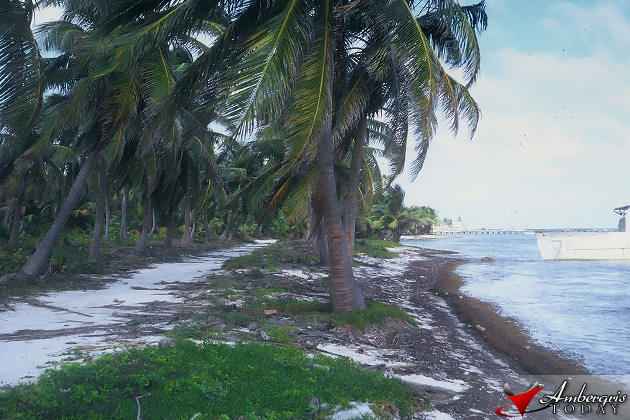 You are standing on the beach of the Village of San Pedro in 1965 more or less by the area of present day Coconuts Resort and Perla Escondida. This was the first road of San Pedro and it ran from the primary school all the way to Victoria House. This road was trafficked by a few Land Rover Jeeps owned by Paradise Hotel, Tio Pil of Coral Beach, and Nando Trejo Sr. The road was declared and opened by the wheels of the three jeeps and once in a while it was deviated more to the back by property owners on the beach. In the sea is the abandoned luxury yacht, The Pamelyn belonging to one of San Pedro’s first foreigners, Mr. Jim Currie of Scotland. The very first building you see in the background is the government clinic located right in front of the R.C. School. The coconut plantation is a dim reminder of a vibrant coconut industry that existed in San Pedro from 1910 to 1931, when it was destroyed by the hurricane of 1931.